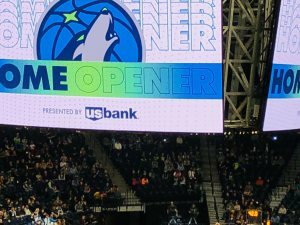 MINNEAPOLIS -- All Star Jimmy Butler received a plethora of boos and cheers by the 18,978 home fans that attended the Minnesota Timberolves' home season opener on Friday night at the Target Center. Butler was booed during the players' introduction and at several times when he touched the ball. But because the disgruntled forward played exceedingly well despite the loud distractions, some of the boos turned into cheers. Butler led the Timberwolves' 131-123 victory over the Cleveland Cavaliers with 33 points and seven rebounds. Andrew Wiggins had 22, Taj Gibson chipped in 13 while Karl-Anthony Towns contributed 12 points and nine rebounds. Derrick Rose pocketed 12, while transferee from Detroit Pistons Anthony Tolliver and Gorgui Dieng had 11 apiece. With LeBron James now a Laker, All-Star Kevin Love picked up the slack with 25 points, 19 rebounds and seven assists. Sophomore forward Cedi Osman shot four treys on the way to 22 points while Jordan Clarkson had 19 points off the bench. Tristan Thompson sizzled 14 points and 10 rebounds and rookie Collin Sexton added 14. Sharpshooter Kyle Korver played for five minutes scored nothing while JR Smith played four minutes and also went scoreless. The Wolves, who played aggressively, led 32-30 after one quarter and 71-54 at the halftime break. The lead was chopped 104-95. Cavs bench tactician Tyronn Lue had one technical for the Cleveland team, while Gibson and Rose had one technical foul apiece. The Wolves fell to San Antonio Spurs during their opening game on the road last Wednesday, 112-108.while the Cavaliers last Wednesday night to Toronto Raptors, 116-104. Pinoy-Americans among the crowd at Target Center. Filipino-Americans at the Target Center. 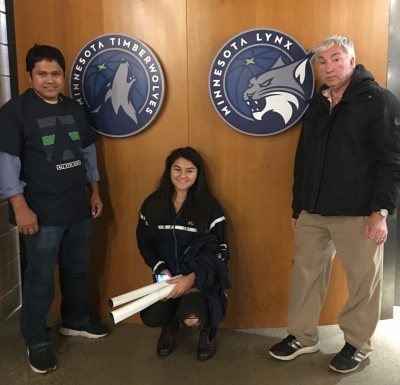 This writer met some Fil-Ams who watched the Timberwolves-Cavaliers game. Cherry Chu Chen and her family originally from Bonifacio Misamis Occidental, drove two hours from Mankato to Minneapolis. Ozamis City native via Willmar City, Minnesota Rose Glodobe Pitzen and her husband Ed together with their only daughter Ashley also in attendance at Target. “We really had fun tonight and we’ll be back here soon, especially for Golden State Warriors and LA Lakers vs Timberwolves games” said Ed Pitzen after the game. The Cavs will host the Atlanta Hawks for their home opener at the Quicken Loans Arena Saturday night while the Wolves will travel and face the Dallas Mavericks on the same night at the American Airlines Arena. Click here to view a list of other articles written by Daniel Quindao Guden.